I am not a conspiracy theorist. I believe many, who exhibit those symptoms, have their tin-foil beanies on too tight. On occasion, however, when multiple sources cite multiple instances of similar events, you really have to wonder what’s going on. What am I talking about? The militarization of the Department of Homeland Security. Their are credible reports, reports that present irrefutable facts that the DHS, and other federal agencies, too, is militarizing. They are buying obscene amount of ammunition, 1.6 billion rounds, small-arms, and IED resistant, armored vehicles—MRAPs. Beginning several years ago, the DHS began stockpiling ammunition, most, but not all, in .40S&W, a favored pistol caliber of law enforcement and federal agencies. They also bought large amounts of 5.56mm rifle cartridges, and 12ga 00 shotgun shells. Add to that the 2,700 armored MRAPs transferred from the Army to DHS, and a newly announced purchase of 360,000 more rounds of ammunition, and any rational person begins to get suspicious. Add one more item to all of the above. 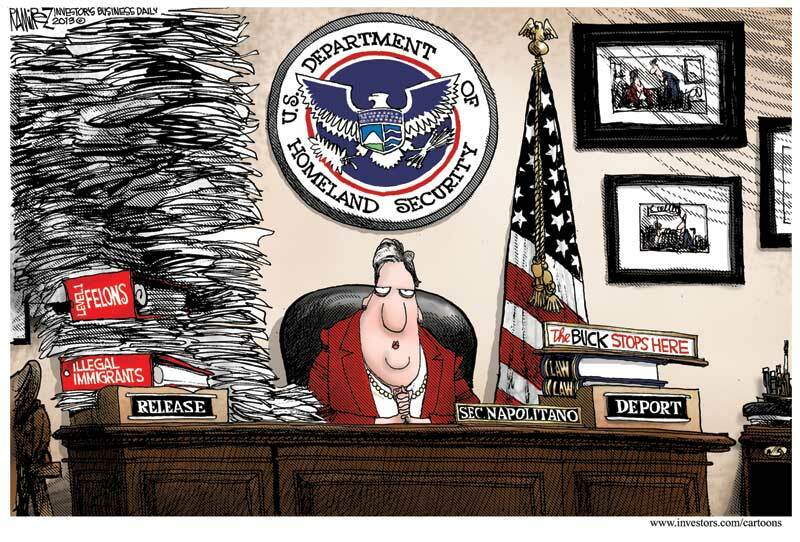 DHS is freeing illegal aliens, criminal illegal aliens because of “sequester.” What a farce! Let’s estimate the cost of all that ammunition. Conservatively, let’s say each round costs $1.00. (Current prices for .40S&W hollow-point ammunition is in excess of $25 for a box of 20.) DHS could have spend that $1.6 billion on prosecuting the illegals DHS has in custody. Instead, Janet Reno turned them loose. Think what could happen when all those criminals hit the streets—another manufactured crises? Some of those conspiracy theorists claim the FedGov is preparing for a coup. I can’t subscribe to that. Not quite, but it certainly is suspicious. I read an article today that was frankly, disturbing. The subject of the article has been present for a long time, decades in many cases. That subject? The conversion of our local police into a paramilitary force. The result? The police are no longer peace officers, they are now law enforcement officers. It is important to note here that contrary to popular belief, the police have no requirement to protect the people. There have been a number cases rising to the US Supreme Court and the Court has said the police have no requirement to protect individuals. The police can only enforce the law or seek those who have broken the law. They no longer work to protect the people but they now protect…what? One common response is to counter acts of terrorism. Really? Then why are these units being used to serve warrants…in the middle of the night…without knocking? That doesn’t sound like countering terrorism to me. Another is that criminals are more heavily armed than the police. They cite the famous North Hollywood bank robbery where two men, armed with fully automatic weapons and wearing body armed engaged in a shoot-out with police resulting in multiple casualties among those police officers. The police actually had to commandeer semi-automatic rifles from a near-by gun dealer. The City of Los Angeles did not provide any long-guns to the police, short-ranged shotguns excepted. In that situation, the police had been effectively disarmed by the LA city government. There were federal grants available, that were used afterward, to provide funds for squad-car rifles like the Ruger Mini-14 and the Colt AR. The city was negligent but blamed instead “proliferation of firearms” instead of accepting their own failures. There are instances where criminals barricade themselves against police. A siege occurs. Most people understand that sieges will end sooner or later. They DO NOT require frontal assaults by armed and armored police to resolve the situation. But, politics demand quick resolutions not patience and the command staff demand a resolution before the media appears and the scene is broadcasted on the local news. Still it come back to the conversion of police from the peace officer mentality to the law enforcement mentality. In the latter case, the Us vs. Them mentality not only develops but is encouraged. A California study in 1997 researched the trend and noted the deficiencies and the dangers of militarization. I can’t cut ‘n paste an excerpt from this study. You’ll have to go to the site and read it for yourself. Here is an excerpt from testimony before Congress on the same subject. Mr. Chairman, distinguished members of the committee, thank you for inviting me to speak today. I’m here to talk about police militarization, a troubling trend that’s been on the rise in America’s police departments over the last 25 years. Militarization is a broad term that refers to using military-style weapons, tactics, training, uniforms, and even heavy equipment by civilian police departments. It’s a troubling trend because the military has a very different and distinct role than our domestic peace officers. The military’s job is to annihilate a foreign enemy. The police are supposed to protect us while upholding our constitutional rights. It’s dangerous to conflate the two. But that’s exactly what we’re doing. Since the late 1980s, Mr. Chairman, thanks to acts passed by the U.S. Congress, millions of pieces of surplus military equipment have been given to local police departments across the country. We’re not talking just about computers and office equipment. Military-grade semi-automatic weapons, armored personnel vehicles, tanks, helicopters, airplanes, and all manner of other equipment designed for use on the battlefield is now being used on American streets, against American citizens. Academic criminologists credit these transfers with the dramatic rise in paramilitary SWAT teams over the last quarter century. SWAT teams were originally designed to be used in violent, emergency situations like hostage takings, acts of terrorism, or bank robberies. From the late 1960s to the early 1980s, that’s primarily how they were used, and they performed marvelously. But beginning in the early 1980s, they’ve been increasingly used for routine warrant service in drug cases and other nonviolent crimes. And thanks to the Pentagon transfer programs, there are now a lot more of them. This is troubling because paramilitary police actions are extremely volatile, necessarily violent, overly confrontational, and leave very little margin for error. These are acceptable risks when you’re dealing with an already violent situation featuring a suspect who is an eminent threat to the community. The testimony continues and it’s well worth a few minutes reading the full article at the website. What is the purpose then, of these paramilitary units? Protecting the people? No. That is not a requirement saith the courts. Countering heavily armed drug dealers? As the testimony above states, that isn’t commonly needed either. We again return to the original question. What is the purpose of militarizing the police? I have some thoughts on that but I’ll not state them here. Those questions should be directed to our elected officials and police. Once all the rationalization is swept away, the answer will be they’re not. Yes, some small force, trained and equipped should be available when needed. Perhaps a force by the State Police or Highway Patrol. But not every Police Department nor every Sheriff’s department needs one. In fact, very few do. All too often, such paramilitary forces are used simply to justify their existence. Use it or lose it. Many federal grants come with these paramilitary forces. No SWAT team, no federal money. That is a very serious mistake. It promotes the Us vs. Them mentality that pits the police against everyone not of the police. That mentality enforces distrust by the police and that distrust is returned by those same people the police are supposed to protect. It’s is a prime example of negative feedback. The more the SWAT teams, the paramilitary forces are used, the more they are thought to be needed. The truth is just the opposite. The less they are used, the less they are actually needed.